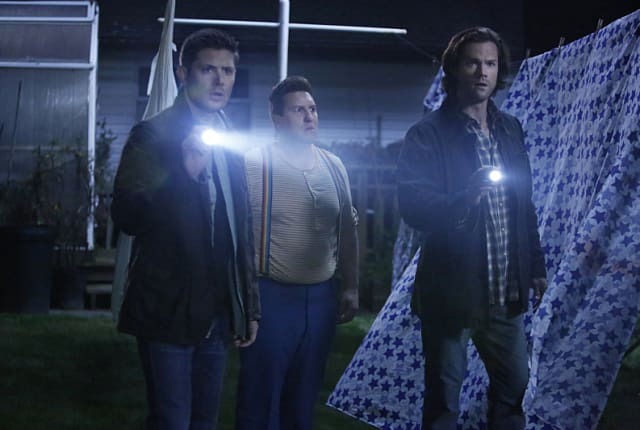 Watch Supernatural Season 11 Episode 8 online via TV Fanatic with over 7 options to watch the Supernatural S11E8 full episode. Affiliates with free and paid streaming include Amazon, iTunes, Vudu, Netflix, YouTube Purchase, Google Play, and Verizon On Demand. On Supernatural Season 11 Episode 8, Sam tries to figure out why he's suddenly seeing his imaginary childhood friend and why Dean can see him too. Sully: If I show you all we can see, you can’t tell a soul. Dean: Yeah because chicks dig the whole imaginary friend thing. Permalink: Yeah because chicks dig the whole imaginary friend thing. Sam: His blood is glittery? Sully: Even when he’s dead, Sparkle can’t stop shining. Permalink: Even when he’s dead, Sparkle can’t stop shining.